My professional career has alternated between academic research and product development, at large software companies and small startups. 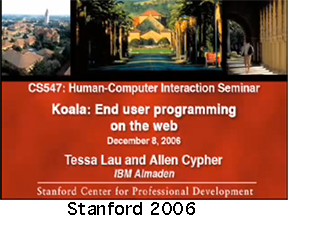 I have written 40 peer-reviewed papers on human-computer interaction, published two books and delivered invited talks in England, Brazil and New Zealand. I cofounded an Apple spinoff to develop an educational software program that I coinvented, and I have developed products for IBM and Microsoft. My main interest is in End User Programming: finding novel ways to bring some of the power of programming to non-programmers, with Programming by Demonstration being my preferred approach. My projects often focus on education, and I have worked with luminaries such as Alan Kay, Don Norman, Larry Tesler and Roger Schank. I received a B.A. 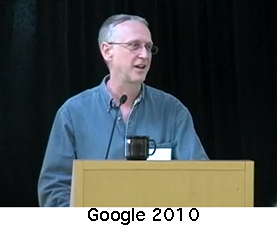 in Mathematics from Princeton University, a Ph.D. in Computer Science from Yale University, and spent several years as a post-doc and Sloan Fellow in Cognitive Science at the University of California, San Diego. I am currently working at Socratic Arts on automated mentoring. 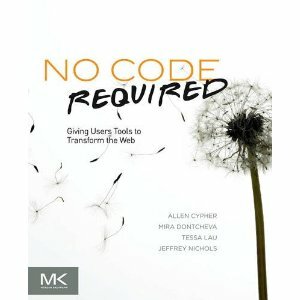 "No Code Required: Giving Users Tools to Transform the Web" is an edited volume of current research on end user programming on the web. It was published in April 2010 by Morgan Kaufmann and is available at Amazon. CoScripter is a smart macro recorder for the Firefox web browser. You can record your actions in the browser, replay them, and share them with others. I am a co-inventor of Stagecast Creator, a program that enables children to create their own games and simulations, and to publish them on the World Wide Web. Creator was originally called KidSim, and then Cocoa. Eager was one of the first intelligent agents. It constantly watches your actions on the computer, and when it detects a repetitive activity, it writes a program which will perform that activity for you. "Watch What I Do: Programming by Demonstration" was published in 1993 by MIT Press. It describes 18 different programming by demonstration systems, has a preface by Alan Kay, and includes a chronology, a test suite, a glossary, and an extensive bibliography. The entire text of the book is available on the web. I have other hang gliding photos. I have some photos of Nepal, including a 360 degree panorama of Chukung in the Everest region, and some other travel photos. Andy Cockburn on Vampire: He's rightside up in New Zealand.